There are three species of pond-lily in Quebec, there is the Variegated pond-lily, a very common one, this one : the Small yellow pond-lily, also fairly common, and a hybrid of this two species: the Red-disk yellow pond-lily less often encounter. The Small yellow pond-lily is easily distinguished by the size of its leaves and flowers two times smaller than the other two species. 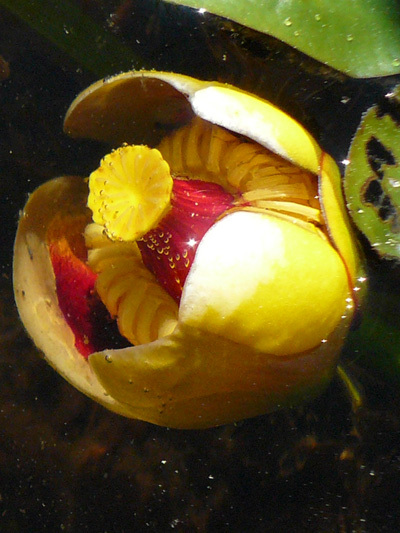 Pond-lilies have floating leaves and submerged ones. The fruit usually develop underwater. The Small yellow pond-lily often has the other side of its leaves purple.